> Macro Algae>Red Macro Algae>Ochtodes Sp. The marine algae Blue Ochtodes sp. with its purple/blue colour is a fantastic addition to the marine tank. It will add a beautiful and rare to find colour to the tank and will quickly become a centerpiece. This macro algae species has a very dense structure which offers great hiding space for beneficial hitchhikers like copepods, rotifers, starfishes and other hitchhikers. Please bear in mind that the dense structure of this macro algae makes it much easier for hitchhikers and although we dip our algae before posting in a professional solution, especially starfishes might survive this. If you don't want them please inspect the algae very closely before adding it to your tank or keep them in a quarantine tank or similar for the start. The Ochtodes algae species will arrive at yours more brown looking, which is normal for it, as it changes the colour once we take it out of the water and it comes in contact with air. It will turn back its colour normally within 1-2 days back in the tank it will change its colour back again. The colouration of the Blue Ochtodes will change between purple to blue, depending what light spectrum and intensity it gets. Less light lets it turn more deep blue. As it is quite a fragile macro algae species we will add a bit more for you than you order to account for any damage in transit or for small break ups. This algae will easily attach itself together again and to rock or similar. Please just leave it therefore in an area without a current and good light. The Blue Ochtodes macro algae prefers good light, but not too much. Its deep blue colour is best to reach with a 6500k-10000k light. With direct sunlight or out of the water it will turn brown. When you receive these algae it will look brown, but once back in the marine water it will get its colour back, varying in blue / purple shades, depending on what kind of light and how much light the Blue Ochtodes gets. The whole algae are very tasty for herbivore marine fishes, like the Foxfish, Tang species etc. Therefore it is recommended to keep this marine alga in a safe area for a reserve until you like to offer it as additional food to your fishes. This algae will attach itself when left for example on the rock for a few days without movement. Keep an eye on floating bits of it in your tank as they will do the same when they get the chance too. Whitish parts of this macro algae should be removed as they are decomposing. Like for most marine macro algae a higher level of Nitrate and Phosphate, in addition to the supplement of Iron, Magnesium and Trace elements will improve the growth of this marine algae. We do our best to quarantine, treat and remove any unwanted hitchhikers, parasites etc from our macro algae but we can not guarantee that the algae are completely free of anything unwanted, not limited to Copepods, Rotifers, starfishes etc. This is simply because that sometimes eggs, spores, etc can remain viable but not visible and hitchhikers can still stay hidden, especially in dense algae structures, despite our strict quarantine efforts. All macro algae will be thoroughly dipped in a professional solution to deactivate hitchhikers as good as possible before posting. But still inspect your algae on arrivel closely. If you don't want this, please send us a message together with your order. Path: Home > Macro Algae > Red Macro Algae > Ochtodes Sp. Hello. I received last week the algae, it looks really nice. But the colour looks more pink in my tank. My water parameters are good. I have around 5 Nitrate and 0.03 Phosphate. How do I get a more blue colour please? Hello Marie. Thank you for your question and we are happy that you like the macro algae. The colour of the Blue Ochtodes depends of the light you provide. We have best experiences with full spectrum lighting, around 6500k. When it gets direct sunlight the algae tends to become more purple. Although the algae likes good light it will show a deeper blue colour when it gets a medium strong light. If you have any further questions don't hesitate to contact us. Do I need to glue it, or how will it stay in the bottom of my tank? This was my first order with Livealgae and it was very good. Nice lookign algae, well packaged and good communications. I was impressed. Thank you for the time you took to leave the feedback. We are very sorry that you are not happy with the macro algae you have received. To make sure that all our customers are fully happy with their new additions we offer a 100% Satisfaction Guarantee on arrival. As we haven't heard anything back from you we thought that you are happy with your new macro algae species. 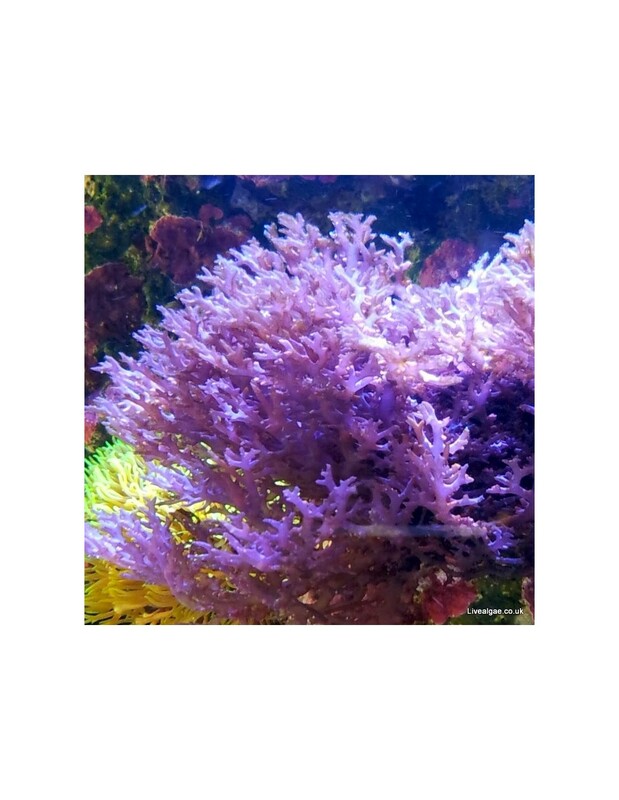 Regards the price of our macro algae we offer as well a Price Match for all our live algae, where we match the price from other algae business websites, beside of Ebay or other auction sides to ensure that you get the macro algae for the best price possible. We are sorry, but we can't price match private sellers, as we are a UK based business paying UK taxes. Regards the shipping time unfortunately the weather made is over the last days quite hard for us to ship all algae orders within the two working days we are normally aiming for. Especially the week when you have placed the order the weather conditions have been quite bad, with freezing temperatures over night which made it very hard for us to safely post the macro algae as we are more subject to weather fluctuations than non-perishable product seller. We are sorry to hear that you were not happy with the posting time, although we have tried to explain the problem with the weather via email to you. Luckily beside of the challenging weather conditions nonetheless we were able to post you algae already on the 4th working day safely to you. As our customer satisfaction is the most important thing for us, we happily offer you therefore still to post the macro algae species back to us ( via Royal Mail First Class Signed for ) and we will refund you the purchase price and the costs for the return postage paid. We hope you are happy with this solution. Should you have any further questions please don't hesitate to contact us again. Not only does LiveAlgae have a great range and speedy delivery, but I had a query on a Sunday afternoon and got superb customer service from Manfred.I would totally recommend! !